�We�re getting the aeroplane painted next week�. �You are?� I mouthed, quietly astounded. Ken and Sue�s Rockwell AC11 had a pristine paint job as far as I was concerned. �Yeah. It�s getting a bit tatty�. If Ken thought the Rockwell was tatty, what did that make my Cardinal? Positively scruffy, I suppose. I�d owned the Cardinal from new for twenty-two years and it was still wearing its original paint. Well. When I say: �still wearing its original paint�, I mean the term fairly loosely. The wing leading edges had gone from white to green and then to bare metal over the years. When it rained, the upper wing surfaces leached a white emulsion of oxidised paint which ran down the side windows and made them opaque. The yellow nose and the brown side-stripes had developed a patchy thin patina that can only be achieved from years of being ravaged by wind, sun and rain. The fibreglass around the nose was starred and pitted. All in all, a genuine �distress-finished� Cardinal, as an antiques dealer might say. �Ha bloody ha.� I replied, trying my best to sound hurt but laughing in spite of myself. But then Sue offered to buy me a beer so I couldn�t keep up the hurt act. We then fell, with much mirth and beer-fuelled speculation, to discussing the best way of transferring a Rockwell�s paint job to a Cardinal. But a seed had been sown. Although I�d been aware for a long time that the Cardinal was in desperate need of a paint job, I�d persisted manfully in putting off the evil moment. The reason was that, over the years, I�d seen so many paint-inspired disasters. I�d seen aeroplanes with bad paint jobs from day one - orange peel finishes and so on. I�d seen removable panels and screws painted over so that at the first maintenance, the seemingly excellent paint work was wrecked. I�d seen plastic wing tips welded to metal wings by paint. I�d seen paint peeling off years after the paint job because the chemical stripper wasn�t washed off properly. I�d seen all kinds of disasters. But these disasters were probably all avoidable with proper supervision of the job during its progress. The thing that bothered me the most was that my Cardinal, as far as I could see, had no corrosion whatsoever. 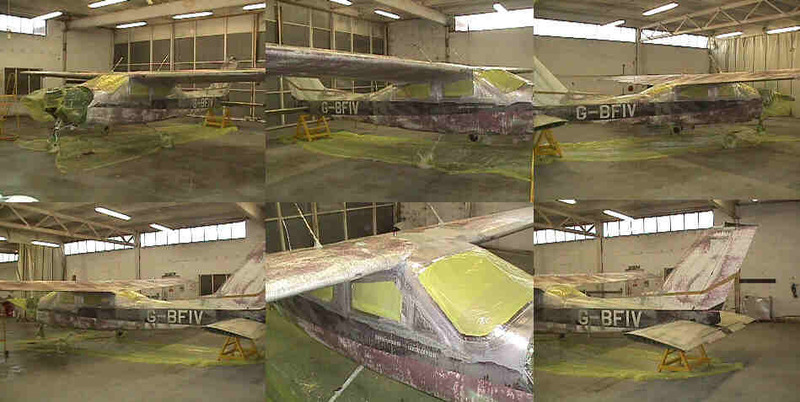 This was a testament to Reims Cessna�s original attention to detail during painting. All panels and so on had been zinc-chromated before fixing together. So the panel overlaps were protected by chromate. This was the real reason why the Cardinal had no apparent corrosion. Water will always seep through airframe-flex induced paint micro-cracks. This water will then lie between the panels. But on my aeroplane, the water had a layer of chromate to reckon with before it could get at the metal. I reasoned that chemical stripper � even in a weak solution during after-strip pressure washing � could permeate between the panel overlaps and destroy the protecting chromate layer. And then the hideous spectre of corrosion would wreak havoc with my beautiful aeroplane. India Victor and I had had so much fun together over the last twenty-odd years that she was completely part of my life. I couldn�t let this happen. But, on the other hand, she definitely needed painting. I�d have to bite the bullet. In many ways, this is really the hardest part � and indeed, the hardest part to give advice about. For any paint shop you happen to mention, there will be people who�ll say: �Good God. Don�t go there under any circumstances...� And there will be other people who give exactly the opposite reply. At least that�s my experience. I wandered around in limbo for quite a while. I talked to people. I peered at their aeroplanes. I went to paint shops to take a look. As you may imagine, I wasn�t too keen on this business stratagem � no matter the quality of the work. And so it went on. I suppose what I wanted was a paint shop that turned out high quality work, but didn�t have too many customers � a bit of a tall order. I came to this conclusion after I�d spoken to somebody who had gone to one particular shop. During a progress-chasing visit, he�d found that his aeroplane had been left in a corner for two weeks so that some rush job could be fitted in. That would have miffed me enormously. As I say, choosing a paint shop is a difficult matter to give advice about. It�s not like choosing an aero-engineering concern where you build up a long-term relationship � or not, as the case may be. Painting your beloved bird is something you don�t do too often. So every time you have it done, it�s rather like the first time. You can never guarantee that the place you used ten years ago still maintains anything like the same standards it had in the past. In fact the opposite can easily apply: The bad paint shop of today may turn out to be pretty good in ten years time. But what I did in the end was this: I followed my own judgement. One day I flew down to Lydd in Kent for a jolly and lunch � that�s right, yet another two hundred Dollar hamburger. I noticed a paint shop there and walked in � it wasn�t a concern I�d enquired at before. An Aztec was in the shop just having its paint job finished. It looked pretty good to me. The shop was clean, the atmosphere was business-like and friendly. I got to talking to the paint shop guy, whose name I found out was Andy. �What would you charge for my painting my Cardinal? I asked. The price he quoted was within my budget. Not the cheapest quote I�d had. But within reason, I always try not to let low prices influence me too much � especially when it comes to aeroplanes. �Can you do it during January?� I asked. This meant being without the Cardinal for six weeks. But to be fair, I mused to myself, the Christmas holidays do get in the way. My mind was practically made up. The place felt right. Andy seemed like a straightforward honest guy who didn�t make rash promises, wanted to do a good job and was keen to earn a living. His wasn�t the cheapest quote I�d had � but I never mind somebody making a decent profit if they give value for money. But, then again, I�m never one for rushing into things. For the first three days of that week, I did some serious thinking. In the end, it came down to this: Did I trust my own judgement about people, or didn�t I? I decided I did trust my own judgement and gave Andy a ring. And that�s how I chose my paint shop � a decision made almost entirely on my judgement of the character of the man and organisation who were to do the job. There�s probably better ways of making these momentous decisions, but that�s how I did it. So my advice about choosing a paint shop � and I suppose quite a lot of other things in life - comes to this: Trust your own judgement � especially your judgement of the character of the man who�s taking your money. I�d now committed myself to the job, so the race was on to find a paint scheme. The sort of scheme I wanted was something unusual and distinctive, but not garish. Tasteful but individual. Various ideas resounded round my head. One idea I had was to paint the Cardinal in the manner of a seagull. I consider that the Cardinal is a very graceful machine with its high wing and clean aerodynamic lines - very much like a seagull in fact. I photocopied the outline of my aeroplane from the workshop manual and set to work with watercolours. The ideas I came up with varied around the theme of a generally white underside, fading into silver grey upper surfaces with dark grey nose and wingtips. I was reasonably pleased with my efforts and thought I was at last getting somewhere. One evening at the flying club, I was proudly showing some of my painting attempts to my mates. I suddenly noticed Sue laughing to herself as she looked at one of my efforts. This was strange. What was funny about a picture of a Cardinal? 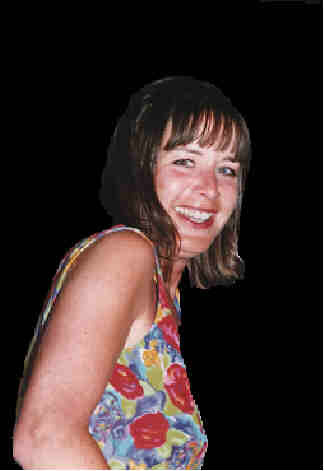 �What are you laughing at Sue?� I asked. She then burst into uproarious laughter and so did everybody else in the bar. �And paint a big white patch on the tarmac under the tail...� Said some other joker. Eventually, I saw the funny side too. But from that moment, I went right off the seagull idea. My mates are a rotten lot of sods. I then came up with the ridiculous notion of a �distressed� finish. I was really getting twitchy trying to think of ideas. This latest wheeze was to have the aeroplane air-brushed so that it looked like an apparent wreck. Something like having it painted with the skin apparently peeling away and the internal ribs showing. That kind of thing. But I dismissed this idea as being too ostentatious � I wanted something more tasteful. The Cardinal is a beautiful aeroplane after all � such a scheme would demean it. By this time I was becoming desperate and nearly on the point of opting for a �standard� scheme. But then I had a brilliant idea. Why not look on the Internet? I typed �Cardinal� into the search engine and immediately found out that practically every baseball and football team in the USA is called The �something or other� Cardinals. So I refined the search with �Cessna� and straightaway found the Cardinal Flyers Online (CFO) web page. And the Cardinal Flyers web page had a photo album. I searched through this and came up with pictures of a paint scheme that I really liked and two that were pretty good. Armed with prints of these, I once again sought the opinions of my mates at the flying club - pretty foolhardy I know after the �seagull� business. But even Sue picked out my particular favourite as her choice. This particular Cardinal was the property of one Paul Millner. With my mind now made up about the paint scheme, I thought it might be a bit cheeky to �pinch� Paul�s scheme without asking. So I trawled through the membership list and found his e-mail address. A day later I had a reply from Paul. He didn�t mind one bit if I purloined his scheme and he offered the information that the design went by the name of �Cold Flame�. He also asked me to send him a picture when the job was done. I replied �thanks� and that I�d certainly send him a picture. But the next e-mail I received was from the �Cardinal Flyers Online� Digest� [digest@cardinalflyers.com]. Paul had enrolled me as a member. I�d never heard of the Cardinal Digest before, but was soon avidly reading my way through it. The Cardinal Digest is an informal grouping of Cardinal owners, pilots and other interested parties. If you have a Cardinal-related question, answer or observation, you simply post it on the list. All the current questions, answers, observations and information are e-mailed to you under the benign and knowledgeable editorship of Paul Millner. The Cardinal Digest is free � you just have to enroll and it�s a brilliant idea. I soon found myself writing in with aircraft painting related and other queries. And I was soon getting replies. Keith Peterson quickly showed himself to be a master of the arcane intricacies that apply to the maintenance and foibles of the Cardinal. I learned a lot from Keith (and I still am). Randy Reamey e-mailed me with a list of the major do�s and don�ts of aircraft painting. Randy used to be an aircraft painting expert with the US Navy and really knows his stuff. I found that arming myself with Randy�s advice was extremely helpful when I subsequently visited the paint shop during the stripping and painting process. From the things I talked about and pointed out, poor old Andy in the paint shop must have thought I was some kind of painting expert � such must have seemed the depth of my knowledge. �I didn�t realise it was so complicated. I nearly fell off my chair when I saw it...� wrote Craig. But Craig had come up with the goods. There, attached to his e-mail, was a perfect bit map of my new paint scheme. Thanks Craig. Now I had no more work to do. Craig had done the lot. It�s amazing to realise that I don�t know Paul, Keith, Randy or Craig personally. In fact, they�re all on the other side of the Atlantic from me. And the only reward they could possibly gain from their hard work and dedication in helping me was the pure satisfaction of helping another Cardinal owner. A great bunch of guys. And just to say �thank you� to them seems inadequate. But thank you. And now I had my paint scheme. The paint shop date was set - December the 6th 1998. Everything was ready to go. On the morning of December the 6th, I trudged across the dew-laden grass of my home field of Blackbushe. It was a gloomy, murky morning. Visibility was about three Kilometres. Not a cat�s-paw of wind freshened the crepuscular atmosphere. I pre-flighted India Victor and as I lowered the flaps, rivulets of water ran onto the tarmac. I taxied out, rolled down the runway and for the last time in her old paint colours, India Victor climbed into the Blackbushe sky. The flight to Lydd was eerie and quiet. Nobody was talking on the radio, India Victor buzzed through the dull yellowish air surrounded by its own goldfish bowl of murky light. Fingers of mist probed into the valleys below and not a soul seemed to be moving. It was as if the world had ended. I sighed to myself and moved slightly in my seat. The aeroplane started to swing slowly to the left. I replaced my knee under the control yoke and exerted a minute upward pressure. The Cardinal grudgingly settled back on course with her wings now level again. She didn�t want to go, I thought to myself, she was trying to turn back to home. �This won�t do...� I said to myself and with an effort I pulled my mind out of this stupid daydream. It was just that on the previous flight I�d run a bit long on the right tank. The tanks needed balancing up that�s all. That�s why she was trying to turn left. I reached down and selected the left tank as I passed the ancient port of Rye. Well, I say Rye is a port � it would be more true to say it was a port once. Since Rye�s mediaeval maritime heyday, the area has silted up very badly and the �port� is now about a mile inland. But other parts of this ever-changing coastline are suffering from the opposite effect � the erosion has to be seen to be believed. Abandoned houses hang at precarious angles on cliff edges, their kitchen windows gazing nervously downwards at the never-resting sea. Complete villages sit a few yards back from the coastline, waiting resignedly for their inevitable turn to come. Lydd is a notoriously hard airfield to see. It lies towards the tip of the Dungeness peninsula; a promontory of land which pokes out into the English Channel towards France. The honour of occupying the very tip of Dungeness belongs to a massive nuclear power station. I could see the power station, but I couldn�t see the airfield. I could see where the airfield should be though. The flat vista of Lydd Airport lies in the Romney Marshes � a very flat featureless piece of landscape itself. As I forced my eyes to focus at a distance rather than concentrate on the tiny marks on the windscreen, a runway magically materialised before my eyes. Lydd Airport. It was hard to understand how I couldn�t have seen it before, so solidly was it contrasted with the tussock grass, lakes and ponds of Romney Marsh. But every time I fly to Lydd, I have the same problem. As I swept downwind left for Runway 22 I looked down and marvelled once again at the quirky ideas that the military sometimes has when it�s spending other peoples� hard-earned money. A massive masonry wall, probably a hundred yards in length was sitting � as it had done for the last sixty years or so - just to the south of Lydd Airport. This wall is shaped to resemble a parabola with its open end facing towards the south and France. The idea was that during the first years of World War Two, a lonely observer mouldered his life away at the focus of this parabola while listening intently for the sound of incoming German bombers. Exactly what this observer was supposed to do if the bombers came from a direction other than due south is not recorded � he couldn�t very well swing the wall round a bit. Luckily for civilisation, someone invented radar and the parabolic wall has become a lichen-covered monument to itself. I taxied onto the damp Lydd apron, shut down and strolled over to the paint shop to meet Andy. He had everything ready for me and was eager to get on with the job. I had to taxi the Cardinal into the paint shop as, no matter how we tried, we couldn�t hand-manoeuvre the aeroplane over the hangar door track. That�s just one of the problems with the small Cardinal wheels. 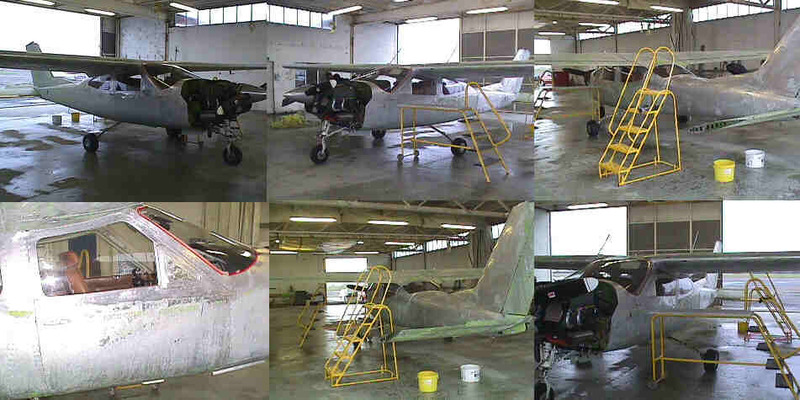 The aeroplane was now in the paint shop and Andy was starting the preparatory dismantling. I didn�t want to stand over him and make him uncomfortable, so there was nothing else for me to do but to go to the airport restaurant for a cup of tea. I sipped at my tea and gazed out of the window. John should be appearing soon in his Saratoga to take me back to Blackbushe. John is a good friend of mine and he and I go back many years. John has a beautiful brand new Saratoga, many thousands of hours and absolutely lives and breathes aeroplanes. We�ve had many adventures together, John and I. Two of the most notable of these being the time we flew to the Middle East and the months of work we put in while we supported each other in doing our Instrument Ratings. They were great days with, hopefully, many more to come. But they are different stories. The Saratoga landed and John walked over to join me in the restaurant for a cup of tea. �All OK?� Asked John with a smile. �Yep. No problems so far...� I joked back. We decided to take the �scenic� route back to Blackbushe. This involves flying at low level over the sea just off the English south coast and then striking inland about forty miles due south of Blackbushe. This routing became something of a habit with John and I when we were visiting India Victor over the following few weeks. But the scenery is certainly some of the most spectacular in England with soaring white cliffs and towns such as Hastings � the scene of England�s last invasion by the Normans in 1066. And it is indeed the selfsame vista that the pilots of World War two looked down upon (when they had a moment) as they fought the famous aerial dogfights of the Battle of Britain in World War Two. A beautiful and inspiring stretch of coastline. I decided to leave Andy alone for a few days before I visited again. And this next visit was very eerie. The Cardinal was partially dismantled � the cowlings had been removed and were lying on a bench ready for stripping. Paint stripper had been applied to the main airframe with the consequence that the old paint was sagging down the aircraft�s structure in psychedelic loops and whorls, just as if Salvador Dali had been let loose with a few buckets of paint and an open-ended commission to go completely barmy. �That�s a funny paint scheme you�ve chosen...� said John with a laugh. Luckily, I had thought to bring a camera and quick as a flash, hotfooted it out to John�s Saratoga. I was back in a moment and snapping away for all I was worth. About five days later, John and I visited Lydd again. By this time, India Victor had lost her paint and was stark-staring aluminium naked. Just a few scraps of green zinc chromate remained here and there. What a strange and sad sight she was. She had the unreal toy-like look that a young boy�s just-glued-together plastic model aeroplane has before said schoolboy lets rip with his mother�s stolen nail varnish. On the floor under the Cardinal�s right wingtip was a small conical pile of curling flakes of detritus. Rather as though somebody had carelessly tipped a party-size multi-coloured heap of potato crisps there. This was all that remained of the Cardinal�s old paint scheme. �Any corrosion?� I asked Andy anxiously. �No. None at all...� Replied Andy. �...She�s completely clean.� I was very relieved at this � hidden corrosion being my greatest fear. Happily, I picked up my camera and snapped away at the now naked Cardinal. I must admit that as I looked at the aeroplane, I became quite taken with idea of an all-aluminium finish. I dithered with this idea for a while, but as we sat having a cup of tea in the Lydd terminal building, I made up my mind. That fully made up my mind and I relaxed. The next time John and I journeyed down to Lydd, we took our normal route via what everybody at Blackbushe calls �Mig Alley�. The reason for this fanciful name is that the Heathrow TMA to the north and the Gatwick SRA to the south form a VFR bottleneck. And bearing in mind that the airfields of Fairoaks and Biggin Hill also dump their traffic into this honeypot makes it fairly hairy at times. As I have mentioned before, John and I had got into the habit of returning to Blackbushe by the ��Scenic Route�. But more of this in a moment. When we arrived at Lydd, not much was different with the Cardinal from the previous visit. She was still �naked�, but the flaps and ailerons had been removed and a coat of chromate primer had been applied around the front firewall area. While we were there, we helped Andy fix the already chromated cowling back in place. This was a prepatory stage to the complete chromating of the aeroplane. I looked at the flaps lying on a bench and wondered what they weighed. I lifted one by a corner and was completely amazed. �Hey John. Come and weigh this flap...� I said in complete surprise. John did so and was duly amazed as well. Honestly, you could pick up a flap with one hand and wave it around in the air, it was so light. So after a cup of tea and further wonderment at the amazing strength and lightness of aircraft structures, John and I headed back to the Saratoga and the �Scenic Route� home. Our usual ploy was to depart Lydd to the west and, if the local danger area was open, route straight through it. This part was always interesting because the Army have built �film set� type villages in the area. These villages have roads, shops and houses � just like a normal village. But the houses consist of only the front walls, just like the Hollywood film sets I�ve seen on television. I can only assume that the Army use these villages for �street-fighting� type training � and bearing in mind the danger area, I must also assume they use live ammunition. The Saratoga roared over the cardboard villages and out to sea, heading for the spit of land that juts into the sea just before Hastings. It was our usual habit to conduct the overwater part of the trip at five hundred feet � thus staying legal if any boats or other structure should be on our route. So, well out over the oggin at five hundred feet, we blattered past Hastings. Just after Hastings, the coastline began to rise as it transformed itself into the magnificent white cliffs of Beachy Head. The cliffs rose upwards to meet our altitude as we skimmed along with me looking at the jagged cliff edge a couple of hundred feet off the right wing tip. �Hey John...� I called. �...People on the cliff...� I could see a group of huddled humanity on the cliff top ahead � they were gazing out to sea in rapt concentration. �Then we must obey the law and keep at least five hundred feet away from them...� Said John with a devilish grin as he lowered the Saratoga�s nose and headed for the sea. John levelled out at fifty feet and, on top of the cliffs, the group of people gazed down upon us as we skimmed over the waves. All perfectly legal and great fun to boot. I watched the lighthouse, which stands at the foot of the Beach Head cliffs, flash past as we began our climb for the overland part of the journey home. 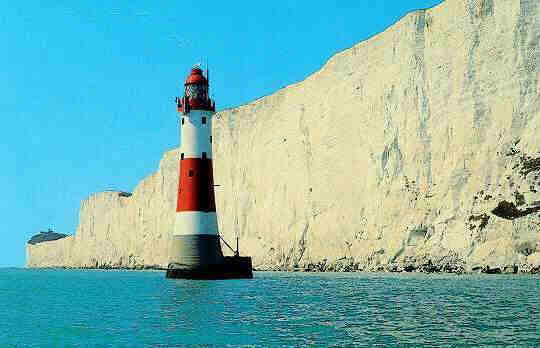 Later that night, I was watching the news on television and one news item was a story about Beachy Head. That afternoon, there had been the biggest cliff fall in living memory. A large chunk of the cliffs had collapsed and the resulting debris had practically joined the lighthouse to the mainland. The cliff fall hadn�t been there when John and I flew past earlier that afternoon. So it must have happened after we had passed. Or..., I realised with mounting horror, ...it happened just as we flew past. �Bloody hell...� I mouthed and immediately telephoned John. �Seen the news John?...� I asked. The next day the Beachy Head cliff collapse was all over the papers � but only because it had been, I was relieved to learn, a very large once-in-a-lifetime fall. Apparently smaller cliff falls were happening all the time. In fact, so much so that operations had been put in hand, many months before, to move a lighthouse back from the cliff edge. This was the �Belle Tout� lighthouse which stands on top of the cliffs and further down the coast than Beachy Head proper. But relieved as I was, I couldn�t let John forget his (alleged) novel piece of aeronautical landscaping, so I sent him an e-mail to commemorate a truly unique event. The next time John and I flew down to Lydd was to be the last time we would go on this particular mission as John had to go to America for two weeks on business. By the time he returned from the USA, the Cardinal�s paint job would presumably be finished. Not only was it the last time we would fly what we had come to call the '�13.15 to Lydd, Departing at Gate Three�, we couldn�t go in the Saratoga because it was in the shop for a one hundred and fifty hour check. 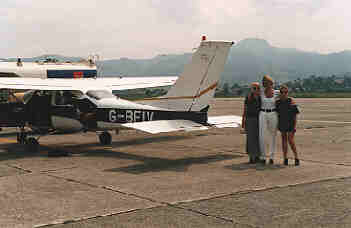 Consequently, we borrowed one of the flying school�s Piper Arrows. As we routed along �Mig Alley�, I found in one of the Arrow�s seat-back pockets, a copy of the �News of the World�. For those who don�t know this newspaper, I will only say that it is one of the more scurrilous of the UK�s Sunday publications. At the time of this particular �13.15 to Lydd�, it was about a week after the New Year and inside the �News of the World� was a fairly explicit �girlie� calendar. And this gave me an idea. As John flew down finals for 22 at Lydd, I reached behind the seat and surreptitiously retrieved the �girlie� calendar. Keeping the calendar out of John�s sight behind the seat, I carefully selected a page which portrayed a barely clothed pneumatic beauty who was a living advertisement for the wonders of silicon enhancement. When the Arrow was about three feet above the runway and John was concentrating on the flare, I whipped out the calendar and held the picture of the pneumatic lady across the instrument panel. �Have a look at this John. New CAA landing test.� I exclaimed. The Arrow plonked and skittered onto the runway and as we slowed down, I folded up the picture and replaced it in the seat-back pocket. �Let�s have a look then...� Cried John in frustrated manner. We were still laughing as we walked across to the paint shop. But what a change from last time. The Cardinal was an overall matt white. According to Andy, this white coat was a base colour that is used before the top colour coats are applied. Apparently, the base coat colour makes a big difference to the �luminosity� and �hue� of the top coat colours. So, after a walk round and a cup of tea, John and I set off for Blackbushe, making careful note this time to avoid Beachy Head. But as John was now off on his American trip, I had a problem in getting to Lydd to view the progress of the paint job. 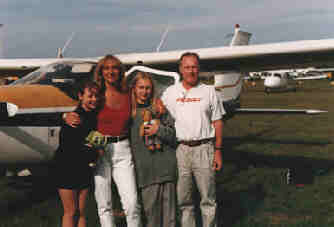 In the event, over the next two weeks I tried four times to fly to Lydd, but was baulked on every occasion. The first time was in Ken and Sue�s Rockwell. But would you believe it? The alternator failed on the very moment of take-off. We had no option but to abandon the trip as the weather was worsening fast and it wasn�t a day to fly with no radios or navaids. And the weather stayed terrible for the next fourteen days. Snow, winds, rain, fog � the lot. There was no hope of flying. So much so that I nearly contemplated driving. I was that desperate. But what with one thing and another, I finally got to Lydd on the day the aeroplane was finished. So I missed all the masking and top colour work. But when I arrived at Lydd on that day, there she was. Outside the paint shop, standing on the tarmac. She looked absolutely beautiful. Ravishingly gorgeous. There was only one thing left to do now: Fly her home. Well, two things: Before I flew her home, there was the small matter of the test flight. But first things first: I conducted the most careful pre-flight I�ve ever done in my life. But after my most meticulous poking and prodding, everything seemed to be in order. So there was only one thing left to do: Go flying. I strapped in and started up. At the hold the mags, t�s, p�s and prop looked good and the pre flight vital actions were completed. Nothing else for it now. I lined up, opened the throttle, and felt the wheels rumbling on the tarmac. The ASI flickered up to 65 knots and I eased back the yoke, attempting to rotate. But the back force was heavy. Luckily though, I had thought about the trim being out of adjustment. In fact, I was ready for absolutely anything � the �what if?� section of my mind had been on turbocharge all the night before. So I gently rolled back the trim � plenty of runway left for an abort if necessary. And then: The rumbling stopped. Off she came. We were flying. In the climb, straight and level at 80 knots, I was just beginning to relax when I nearly jumped out of my skin as the stall warner suddenly started blaring. It didn�t stop throughout the whole flight. But after thinking about it, I wasn�t worried � I had plenty of airspeed and I knew all the vents were clear. I decided it was probably a fleck of paint in the vane mechanism that had got stirred around by the airflow. Anyway, I was keeping Lydd right below me in case of problems. As I levelled off at 2,500 feet and built up speed, a howling gale started shrieking through the passenger door seal and the aeroplane was sitting left wing low. But she was flying. I stooged around for half an hour, testing the gear and so on. Finally, when I was completely happy, I decided to put off the defects for another day, said goodbye to Lydd and set course for Blackbushe. I was just settling on course to route to the south of Gatwick Airport and fiddling about with navigation bits and pieces when I looked up and saw an aeroplane hovering on my left wing tip. I recognised the aeroplane immediately. It was John�s Saratoga. And there, grinning from ear to ear through the Saratoga�s side window, was John. What a great friend John is. He�d literally just stepped off a trans-Atlantic 747 at Heathrow airport, phoned home and heard that I�d gone to collect the Cardinal. With no further ado, he�d got a taxi to Blackbushe, climbed in his Saratoga and come to meet me. A great guy. �Hi John. Good to see you.� I called over our private club frequency. �OK. Lead the way. I�ll stay with you. But switch on your squawk. I had one hell of a job to find you.� John has TCAS in his Sarry, the lucky dog. �That�s what I thought...� I replied with another weight lifted from my shoulders. It�s always nice to have things confirmed. So, in close formation, we settled back and blattered happily over the green landscape of Sussex, Surrey and Hampshire. We were flying home. A beautiful feeling. Luckily, when we arrived at Blackbushe, the circuit was clear � so a �run and break� was in order. With the Cardinal and the Saratoga locked in formation, we wound up to 165 knots in the dive (it was a dead calm day) and roared down runway 26 at 50 feet. Outside the club house all our friends were waving fit to bust. Welcoming the Cardinal home. What a fantastic feeling. �Looks superb Colin.� Said Gerald in the tower as we swept past. �Breaking left John... Now!� I called, grinning all over my face. The runway edge lights flashed beneath me. In my right peripheral vision, the Saratoga�s wings glinted in the sun as John pulled his aircraft into the turn. He was stuck to me like glue. Beautiful flying. �And pulling up... Now!� We swept into the circuit still locked together, John�s aeroplane mirroring my every move. �You go first.� Said John, easing the Saratoga back as we reached the downwind turn. He drifted lazily out of my sight behind me. I was to have the honour of landing first. Or rather the Cardinal was. In recognition of its homecoming. I peeled off downwind, lowered the gear, turned finals and swept onto the tarmac of 26. India Victor had come home. There follows a resumé of the materials, techniques and methods used in the painting of India Victor. 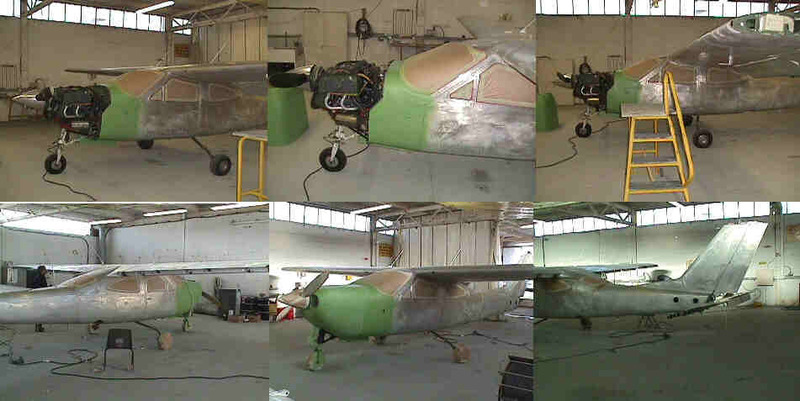 Full strip, respray, flight control removal, interior refurbishment, new weight and balance schedule. 28 litres AD Aerospace paint remover 10600. Spec: British Aerospace AVP 9-033. Boeing D6-1 (hydrogen embrittlement and sandwich corrosion test). 4 litres Alacrom 1200 liquid. 1 coat. 5 litres epoxy primer. 1 coat. 10 litres 4+1 primer. 2 coats. 12 litres Crystal Blue basecoat. 3 coats. 4 litres Seafoam basecoat. 3 coats. 12 litres COB clearcoat. 2 coats. 2 litres white flexibuild paint. 2 litres tan flexibuild paint. Apply heavy coat of paint remover 10600 and leave for 2-6 hours. After lifting of the paint film, remove the mass with suitable scraper and thoroughly clean with pressurised water. Apply 1 coat of zinc chromate epoxy primer and 2 coats of 4+1 primer. MPS 4+1 Polykote primer contains high levels of zinc phosphate and gives excellent corrosion and impact resistance together with excellent film and application properties. Apply 15 line basecoat colour i.e. : Crystal Blue, Seafoam and white basecoat. Apply Acrythane clear overbase for finished top coat. Acrythane acrylic/polyurethane clear lacquer is an ultra-violet absorber and offers a high gloss finish and is particularly good for weathering protection.